The trailer to Pixar's upcoming film "Up" is now available. When I first heard about the premise, it intrigued me and just seeing this trailer now has given me that good ol' Pixar feeling again. Click on the image to see it! 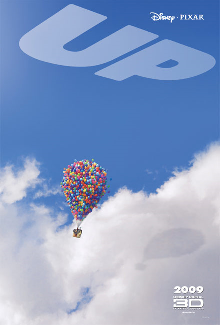 "Up" hits theaters May 29, 2009. Interested in more walking fruits and vegetables? Check out this really clean and well drawn webcomic Chloroville. I like posting art and creations by other artists, and this was something that really caught my eyes. 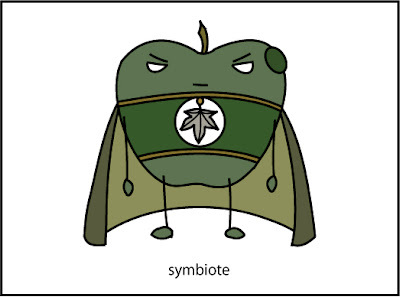 Webcomics of talking fruits and vegetables are rare, (to my knowledge), so I find it entertaining to see how other people take this on. Good job Mr. Victor Wong! Keep up the cool work! A new piece of fan art by MLin. The title is awesome. Presenting to you...Audacious by MLin. Issue 27: A Diversion has just been uploaded. It's been really hard lately to work on the comics, but slowly but surely, they're slowly getting finished. Apologies for the delays! 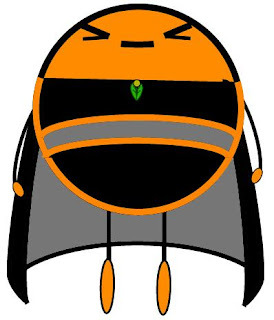 Here's Orangeman without lines. Perhaps the cape is a bit long, but I think it looks pretty cool. Introducing the first ever Orchard Heroes Bookmarks! Two designs are available for multiple characters. Just visit the site or click here. The bookmarks are just one of the crafts that I'll be making available for free. Just a simple download onto cardstock and then cut them out. When I first started to brainstorm the whole Orchard Heroes idea, the first person I bounced a lot of these ideas off of was my old college roommate. I'm not sure how we did it but we somehow were able to create a bunch of comics, draw multiple pieces of art, and even write and animate movie trailers and STILL graduate college. Anyway, I figured if HE hated it, I'd just toss the idea. Turns out he kind of liked it and even created some of the first Fan Art for Orchard Heroes. Below is a piece of his work he did in tribute to the Action Comics #1 cover by Joe Shuster. You can check out his other work at http://www.freewebs.com/roninpro/. Cool stuff. Sometimes you just have to bounce your ideas off of a friend, just to to see if those ideas come back...I don't really know what that meant. Maybe, if your friend didn't like them, I guess he wouldn't throw them back? Anyway, enjoy. Issue 26: Kiwi's Got a Plan is up on the site. I tried to play around with perspectives a bit on this one, showing different angles of viewing the scenes. Hopefully after reading this issue, you get an idea of how musty, damp and...moldy the Mold Forest is. I also tried to use a "focusing" effect in that scene where Moldman stares at the "special" vial, an inspiration from movies. Been brainstorming a few ideas on what I could put on the "Fun Stuff" section of the site that would be fun and ...free. I kind of would like that section to be a place where fans could pretty much print out activities, or crafts and have cool little products. I worked out a few ideas and have been busy designing them so that the activities and crafts are both easy to do and create. So look forward to seeing Orchard Heroes bookmarks, facemasks, coloring pages, and other crap! I'll post some designs as well as rejected ideas here soon. Just read "How To Write For Animation," by Jeffrey Scott, and I have to say it was a really enjoyable read. I bought this book for some insight on how dialogue is written and how character is developed, and I really learned quite a bit. The author writes in a casual tone that makes the more technical aspects of the business more understanding. I'll be trying to apply the things I've learned into future issues of Orchard Heroes and hopefully it'll be noticeable. Even though its written more for those writing scripts for cartoons, a lot of the things discussed are totally applicable to me. If you need something to read, check it out. Below is the first of many graphics of the Orchard Heroes that I've been working on. Sometimes, what's considered basic knowledge to most artists can be like an awakening to someone like me with no artistic background or training. I've recently discovered how great things look without the restricting black outlines after I started playing around on Illustrator. I felt like I had discovered something awesome until I started to realize that a lot of art out there avoid black outlines. Either way, I'm kind of eager to see how other designs turn out with this new discovery. Issue 25: Another Way has just been posted. Click on the link to check it out. A few other updates on the Character Page as well. Disney's much anticipated return to 2D animation begins with the 2009 release of The Princess and the Frog. I'm extremely excited to see Disney return to traditional animation especially if John Lasseter is in charge. He's now the Chief Creative Officer of not only Pixar, but Disney as well. Those who don't know, John Lasseter was one of the founding members of Pixar and director of some of your favorite Pixar films. Check out the trailer at the website linked above. Its looking good so far. One of my biggest inspirations and influences are the stories from Anpanman by Takashi Yanase. I was 11 or so and my dad bought me an English translation collection of Anpanman comics and I remember I couldn't put it down. The art was so simple and colorful and the stories were childish, but it was awesome to me. If you're not familiar with Anpanman, its an extremely popular Japanese comic for children. The main character, Anpanman, has a head that is basically a red-bean filled pastry. Anpanman's creator, Uncle Jam will often replace his head when it becomes damaged when fighting his arch nemesis, Baikinman, a germ. Weird enough? Gotta check it out, its great. Below are paintings that can be found at Anpanman World in Yokohama, Japan. I was cleaning out the email boxes and found some designs I had created with MS Paint. 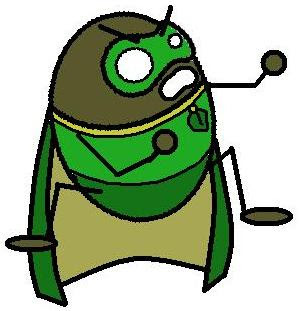 Orchard Heroes was officially created only a year or so ago, but I had been chewing on the idea for some time. Along with the idea chewing comes random sketches and drawings that I tend to do. The designs below were made back in 2005 and it surprised me how much the designs had changed. I wonder if artists often look back at initial designs of their characters and find them amusing. I usually keep all my sketches and designs, but for some reason, I had totally forgotten about these. 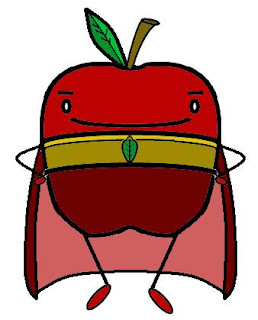 Anyway below are what the Orchard Heroes COULD HAVE looked like...don't ask me about why Appleman looks like he wears his pants up so high...he just did. I had the privilege of attending Comic Con 2008 this year thanks to a co-worker who couldn't make it at the last minute. Being that I live in San Diego, I almost had to go. So my buddy Felipe came down from LA and we headed to downtown SD bright and early on Friday. I had a great time, the whole event was inspiring. Mainly I wanted to learn all the different mediums that are possible when doing anything related to comics. Took lots of pictures and took notes on all the different marketing and merchandising strategies...you never know right? I also attended a really cool panel on webcomics made up of a really entertaining group of web comic artists. Through all the jokes and stuff, they actually gave a lot of really really awesome advice and tips. Hence this blog! I got pretty excited after seeing all the other work that people are doing out there. Check out the awesome Mr. Toast, by Dan Goodsell. Pretty cool stuff on that site. Seeing work like this inspires me! I think the main thing I took away from all of this was to "have fun." With 18 thousand webcomics out there, you've got to go into this thing with an attitude of fun and enjoyment. I end this post with a great piece of advice that just stood out to me, "Don't quit your day job." Yes sir. Hello there! First post and first time blogging here. I'm going to use this blog to share more of the process and thoughts that go into creating the Orchard Heroes webcomic. I'll also be sharing bits of art or designs that I'm working on and also all other things that I find cool and interesting. Things that... tickle my fancy. Was that creepy? Sorry. That's it for now, just kind of wanted to post the first post so I can see how it looks on the blog.